Going vegetarian at age 10 and and vegan at age 18, I eat copious amounts of fruits and vegetables; I’ve been nicknamed the family "rabbit.” When I found out that every Tuesday morning around 5am two boats dock near the Honorable Louis Sylvester Sporting Arena for a San Pedro style Farmer’s market, Monday’s bed time was 9:30pm. I have a love for fresh produce and there was no way I was going to miss out on the week's delivery. Luckily, my new friend Kate, who moved to Ambergris Caye 5 years ago, took me under wing. As we pulled up to the docks around 5:15am, nada. We were amongst the other bewildered veggie enthusiasts. A man on the dock spoke up, “there are three possible reasons why they are late: they broke down, got stopped by customs, or are still on holiday. If the boat got stopped by customs, they will be here by 6am.” I felt a look of disappoint spread across my face. I have been holding out on actually going grocery shopping so I would have plenty of room in my fridge for all the goodies I planned on buying today. Kate turned to me and reassured me that although this MIA boat delivered the rarer to find fruits and vegetables on Ambergris Caye, the second boat normally comes a bit later. With our stomach beginning to rumble, Kate whisked me to the taco stand, known for its cheap prices and delicious food. Never would I have guessed my morning would start with cabbage and bean tacos. We finally ventured back to the docks around 6:30am, to see a huddle of people eyeing the beginning of the freshest produce in San Pedro. If Mary Poppins had a boat, this was her boat. Bag after bag, crate after crate, vegetables and fruits were carried off the boat on to the shore. Within 10 minutes, impatience got the best of everyone. How could it not... fresh pineapple, watermelon, cantaloupe, apples, plantains, baby mangoes, little banana trees, cauliflower, avocados, lettuce, cabbage, carrots, potatoes, tomatoes, onions, “Cho-Cho"(Mirlton), cilantro, corn, and habanero peppers were just waiting to be claimed. I grabbed some plastic bags and followed Kate’s lead. 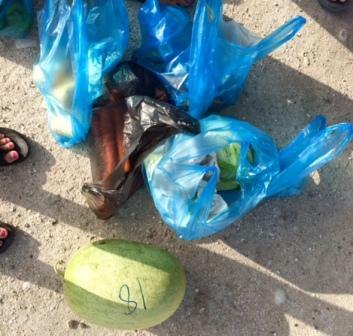 The bags of produce that were carefully grouped along the lagoon, were special orders. Everything else was fair game. As prices were nowhere to be found, I shopped knowing that these were the best prices on Ambergris Caye. 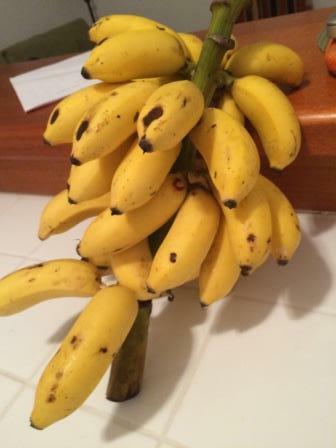 When my personal pile grew larger than my stomach, I headed to a picnic table where the produce man was stationed. There is no credit card machine, no fancy scanners, no PLU codes - just a scale, notebook, and pen. 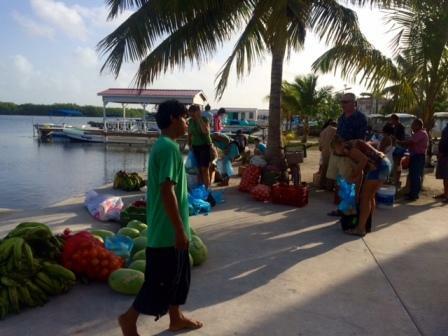 I ended up spending $35 (USD) on all my fruits and veggies, a deal for both US and Ambergris Caye.